We’d love your help. Let us know what’s wrong with this preview of The Lost and the Found by Cat Clarke. When six-year-old Laurel Logan was abducted, the only witness was her younger sister, Faith. Faith's childhood was dominated by Laurel's disappearance - from her parents' broken marriage and the constant media attention to dealing with so-called friends who only ever wanted to talk about her sister. To ask other readers questions about The Lost and the Found, please sign up. What age was this written for? Is Laurel assaulted in this book?? I just wanted to know because sometimes that can be uncomfortable and very sorrowful to read..
Holly She is assaulted but it doesn't go into much detail. This book has a killer twist. The kind of twist that makes you question everything you’ve just read. You will feel compelled to mentally rewind the story to try to spot the clues leading to the big revelation that is so, so worth it. I now realize that I settled for less than I should have. I really did think it would only be about a family coping with the return of their long lost daughter whom they thought they would never again see. It’s so much more than that. I don’t want to give to 3.5 stars. It’s so much more than that. I don’t want to give too much away, because it’s really up to you to discover all there is to, but keep in mind the word ‘‘survival’’ as it’s one of the main themes. Boy this author is good. She wraps everything up so perfectly. Just the not-really-an-epilogue epilogue left me wondering, but it’s not an open ending per se, in my opinion, so I’ll just assume what I think will happen will indeed happen. It’s a fast-paced emotional story—but an adjective that clashes the latter is ‘‘captivating’’ since, ultimately, that’s what it is. It’s sort of a subdued psychological thriller: the spooky scenes are not frequent, though they are present, but the real focus is on the elusive Laurel and seemingly unreliable Faith. The romance ruined the story’s chances of getting a better rating from me. Not only is it absolutely eye-roll-worthy, but it’s used for plot purposes. It feels contrived, that’s the problem. Plus we are manipulated from the beginning. First Faith makes Thomas seem like the perfect boyfriend, then extremely flawed, then worthy again. Whatever, man. Although the scenes of this book are not particularly mind-blowing, Cat Clarke’s dept is what kept me fixated on reading and reading and reading until words started dancing before my eyes and I knew it was sleep’s way of lulling me in the arms of Morpheus dear. Thank you to Quercus Books for sending my workplace a copy for review! What a rollercoaster! I didn't go into this book with many expectations so I was extremely surprised to come out of the reading experience gushing about how good this book was. I'll start of by saying that my biggest fear is being kidnapped so I probably shouldn't read books like this, but for some reason I find them so fascinating. I loved that this book followed what happens after Laurel is found and how she and her family c Thank you to Quercus Books for sending my workplace a copy for review! What a rollercoaster! I didn't go into this book with many expectations so I was extremely surprised to come out of the reading experience gushing about how good this book was. I'll start of by saying that my biggest fear is being kidnapped so I probably shouldn't read books like this, but for some reason I find them so fascinating. I loved that this book followed what happens after Laurel is found and how she and her family copes with the adjustment and also with the police trying to track down the man who took her. It was so interesting to see how Laurel coped with being put back into the real world. At about the half way mark, I honestly couldn't stop flipping those pages because I just HAD to know what happened. The mystery aspect was fantastic and gripping and was super intriguing the whole way through. I did guess the twist at the end though which was a bit disappointing, but I love how the author did it (if you've read it, you'll know what I mean). I really wanted an epilogue tho. LIKE, JUST A COUPLE MORE PAGES PLEASEEEEE THAT WOULD BE GREAT. I have been wanting to read this book for a long time, but for whatever reason I kept putting it off. Boy I'm glad I finally did! 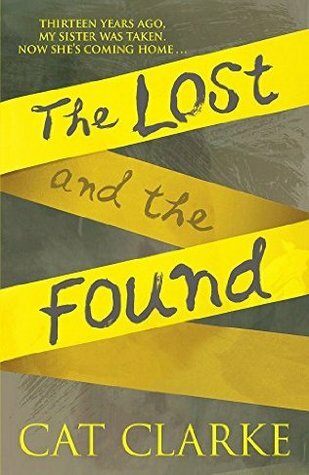 "The Lost And The Found" is the story of Faith, when she was 4 she witnessed the kidnapping of her 6 year old sister Laurel. After 13 years Laurel is found wondering around her old child home clutching her favorite teddy bear. This story had me captivated with its twists and turns and even though I kinda figured out some things I wanted to see how it played o 4 stars! This story had me captivated with its twists and turns and even though I kinda figured out some things I wanted to see how it played out. Something's did surprise me. To tell the truth I don't know if I was happy or not with the ending. I'm still thinking about even hours after finishing reading this book. Even though this story is told from Faith's POV I tried to get in everybody's head and I did sympathize with all of them. As a parent imagining losing my child for so long clinging to the hope every single day to finding her. As a sister seeing how she was taken away and not really having a chance to truly have a sister. Then having that person back, familiar, but a stranger at the same time. Everything Faith did and felt I understood it made me think how when something like this happens every single member of the family becomes a victim. Did she do the right thing? I'm not sure part of me thinks yes and another part of me says no. Have you ever wanted something so badly that your whole life is centred around it? Faith is sure that if only her older sister Laurel could come back from wherever it is she has been taken, that all will once again be right in her world. Her life has been dominated by Laurel's disappearance, and Faith feels somehow responsible - why had the abductor taken Laurel and not her? But when Laurel returns, thirteen years later, all is not as Faith had imagined. Dark and disturbing things happen that lea Have you ever wanted something so badly that your whole life is centred around it? But when Laurel returns, thirteen years later, all is not as Faith had imagined. Dark and disturbing things happen that leave Faith wondering just who Laurel has become. I enjoyed the cat-and-mouse relationship between Faith, her boyfriend Thomas and Laurel. The author has perfectly captured the see-sawing emotions of the teenaged Faith; the joy of Laurel's return; the feelings of disappointment, abandonment and guilt as everyone flocks around her sister; the distrust of a sister she no longer knows. There were a few things about this book I didn't like - It didn't quite drag, but almost in places. At the times the writing was flat and laboured. But having said that, I couldn't put it down. It was quietly compelling and enjoyable. I was quite surprised to see this classed as a children's book - I would have thought YA to adult fiction. Thank you to NetGalley and Random House Children's Crown Books for Young Readers for providing a digital ARC of The Lost and the Found by Cat Clarke in exchange for an honest and unbiased review. It's hard to resist a good mystery that is filled with twists and dark turns and that leaves you questioning everything and lets face it, who doesn't love a book that makes you frantically flip through the pages until the very end? There aren't many of us that can resist them. This book is ever mothers nightmare. The possibility, the horror that one of your children could be taken away from you in the blink of an eye with no leads, no suspects, and no where to turn. It is horrifying and chilling It's hard to resist a good mystery that is filled with twists and dark turns and that leaves you questioning everything and lets face it, who doesn't love a book that makes you frantically flip through the pages until the very end? There aren't many of us that can resist them. This book is ever mothers nightmare. The possibility, the horror that one of your children could be taken away from you in the blink of an eye with no leads, no suspects, and no where to turn. It is horrifying and chilling and not something anyone wants to think about but something we all want to shield from one another instead and wrap our families up in a neat, nice, tight bubble where nothing bad will ever get in or disturb. This book brings all those horrors to the surface and puts them out there for all to see, all to fear, and all to sympathize with. It brings out the emotions of the what ifs, and the survivors guilt, and the anguish of losing someone you love and then finding them again. What a family, what a mother, a sister, and a father go through. It was completely realistic, completely enthralling, and completely entertaining and I thoroughly enjoyed it. With enough mystery, suspense, and twisted details to keep you on the edge of your seat and turning the pages. I was really addicted to this story, but I think it was a bit too laboured. The whole premise is that the sister will come back after 13 years and the first 50 or so pages are the build up to that and I hate to say it but it dragged... BUT as soon as Laurel did appear I was engrossed. I wanted to know more about what had happened to her so desperately that I couldn't put the book down. Faith was such a great character to follow because she had a lot of conflicting emotions. Obviously, she was rel I was really addicted to this story, but I think it was a bit too laboured. The whole premise is that the sister will come back after 13 years and the first 50 or so pages are the build up to that and I hate to say it but it dragged... BUT as soon as Laurel did appear I was engrossed. I wanted to know more about what had happened to her so desperately that I couldn't put the book down. Faith was such a great character to follow because she had a lot of conflicting emotions. Obviously, she was relieved and happy that her sister returned, but now she has to handle having an older sister who everyone adores. It's a rough and complicated time for her. I saw the plot twist coming. From about a mile away. I still really liked the explanation and was pretty satisfied with the ending overall. I just wish I'd been more surprised. I think the very last paragraph (before the book excerpt) was the bit that really shocked me. I'll be thinking about it for a LONG time. I loved this story so much! There was something about it that was unsettling the whole time, but the slow, slice-of-life pace meant that I'd always finish a chapter in a hurry for a big reveal. It was a great feeling, to be kept on edge for over 400 pages, and I absolutely did not see the final twist coming. I'm an absolute sucker for stories that have sisters at the heart, and the attitudes of both Faith and Laurel were so interesting as they changed throughout the book. Faith was a great narra I loved this story so much! There was something about it that was unsettling the whole time, but the slow, slice-of-life pace meant that I'd always finish a chapter in a hurry for a big reveal. It was a great feeling, to be kept on edge for over 400 pages, and I absolutely did not see the final twist coming. I'm an absolute sucker for stories that have sisters at the heart, and the attitudes of both Faith and Laurel were so interesting as they changed throughout the book. Faith was a great narrator, and a huge factor for why I read this book so quickly. 5 Words: Missing, family, lies, resent, love. Well, that was not at all what I expected. I'm not even sure what I was expecting when I started this book. But it was definitely a good surprise, and I will absolutely be reading/listening to more Cat Clarke. I loved how there was this hint that something just wasn't quite right, but because of the situation you didn't want to question it. And I loved the way it ended when everything came to a head, not quite what I expected! Wow, this was surprisingly good. i thought this would be interesting because i like books about abduction but it was more dull than i thought it would be. i was disappointed. PERDUE ET RETROUVÉE, c'est avant tout l'histoire de Faith, une jeune femme particulièrement attachante qui m'a vraiment de plus en plus touché tandis que l'histoire avançait. Au départ, j'ai eu un peu de mal à m'adapter à son comportement trop enfantin ou étrange concernant le retour de Laurel. Je l'ai trouvé égoïste et peut-être trop égocentrique par rapport à tout ce qui se passait dans la vie de sa famille et, plus particulièrement, de ses parents. Cependant, peu à peu, Faith est parvenue à me convaincre de la profondeur et de la logique de ses sentiments. Ce n'est pas moi qui ai brisé mes craintes la concernant mais bien elle qui a réussi à totalement me laisser me prendre au jeu. De plus, et c'est là que l'Effet Cat Clarke s'est de nouveau manifesté, Faith est une héroïne qui est vraiment vraiment vraiment vraiment vraiment humaine et réaliste (même cinq « vraiment » ne suffissent pas, si vous voulez mon opinion). J'avais oublié cette putain de capacité que possède Cat Clarke pour créer des personnages qui sont réels. Qui sont là, avec nous, partout. Vraiment là. A chaque fois, je suis ébloui et complètement ébranlé par la complexité et l'humanité des héros de l'auteure. C'est juste tellement incroyable. Il en va de même avec Laurel. C'est une héroïne vraiment mystérieuse et secrète, qui a provoqué toute une panoplie de sentiments contradictoires en moi tout au long de ma lecture. Il y a vraiment quelque chose d'étrange et de limite effrayant chez elle, ce qui est à la fois hyper angoissant mais également ultra captivant et époustouflant. J'ai adoré découvrir son récit et voir le fil conducteur se dérouler lentement mais sûrement vers une conclusion qui m'a dévasté et pris aux tripes. Cat Clarke est tellement, tellement redoutable quand elle s'y met. Les protagonistes secondaires sont, eux aussi, maîtrisés à la perfection. Le cocon familial de Faith et Laurel est développé sans aucun faux-pas. L'auteure aborde des thèmes désormais récurrents dans ses romans à travers les parents des deux sœurs, et j'ai trouvé tous ces clins d'œil vraiment passionnants. Je me suis énormément attaché à Michel qui est sans aucun doute le personnage secondaire le plus adorable de ce roman. Néanmoins, j'ai trouvé qu'il était un peu trop mis côté à certains moments de l'histoire, tout comme Martha et Thomas qui auraient certainement pu être plus mis en avant. Cependant, les quelques fois où nous les apercevons sont déjà suffisantes pour leur procurer une vraie profondeur. C'est justement parce qu'ils sont épais si rapidement que j'aurais aimé pouvoir en savoir plus, mais je comprends le choix de l'auteure de ne pas s'arrêter essentiellement sur eux. L'histoire, avant tout, est là pour que nous découvrions ce qui est arrivé à Laurel au cours des treize dernières années. L'intrigue, justement. Comme dit plus haut, j'ai été littéralement à bout de souffle et anxieux à chaque page que je tournais. Au bout de quatre romans, je commence à connaître Cat Clarke et suis plus ou moins habitué à ses histoires tordues et oppressantes. PERDUE ET RETROUVÉE ne déroge bien évidemment pas à la règle. Je vais aborder un point sensible de l'histoire : sa lenteur. En effet, PERDUE ET RETROUVÉE avance très, très lentement. L'histoire évolue en prenant son temps et ne se livre totalement à nous qu'après énormément de temps. Personnellement, je n'ai pas trouvé ça gênant DU TOUT. Bien au contraire, cela confère au roman une vraie atmosphère à la fois lourde et entêtante. Il y a vraiment quelque chose d'enivrant, de puissant et d'intense dans ce livre, et c'est essentiellement possible grâce à son caractère langoureux, justement. On se retrouve rapidement enfiévré par la lenteur de l'évolution des choses. Cela nous procure vraiment le BESOIN d'en savoir plus. On dépasse le stade de la simple curiosité pour ressentir un vrai manque à combler, sans quoi il serait impossible de se sortir l'histoire de la tête, même pour quelques secondes. Ainsi, j'ai trouvé que la lenteur était nécessaire et totalement justifiée. De plus, le style toujours aussi jouissif, net, clair et parfait de Cat Clarke nous permet d'être complètement ancrés dans le récit. Fatalement, tout finit par s'accélérer et nous recevons finalement les révélations que nous attentions depuis le début. Je dois bien avouer que si beaucoup de personnes ont considéré cette conclusion comme prévisible, je n'avais absolument rien vu venir (tout mon ressenti est donc peut-être biaisé par cet élément, en fait). Les ultimes chapitres m'ont mis les larmes aux yeux et m'ont énormément ému. La fin de PERDUE ET RETROUVÉE est dévastatrice et nous met à fleur de peau. J'ai frissonné, j'ai eu envie de hurler et j'ai été complètement retourné. Cat Clarke nous délivre ici une fin très ouverte mais également plus que satisfaisante. Le simple fait que j'ai pu adorer cette conclusion alors qu'elle prête à réflexion est une preuve énorme qu'il ne faut pas passer à côté de ce roman. Le final de ce récit est extrêmement perturbant et bouleversant mais aborde également un sujet très sensible avec beaucoup de fragilité et de délicatesse. Cat Clarke est une vraie déesse en ce qui concerne les « et si » et les choses qui auraient pu se passer différemment. Ce sont toutes ces possibilités et impossibilités de la vie et tout ce qui ne s'est pas passé qui rendent cette fin éprouvante, exactement comme avec REVANCHE. J'ai tellement, tellement adoré ça. C'est une conclusion brillante, renversante et poignante à la hauteur de mes attentes. This review has been hidden because it contains spoilers. To view it, click here. After rereading THE LOST AND THE FOUND for the third or fourth time, I’ve upped my rating from 3 to 4 to 5 and for the first time I’m completely rewriting my review for a book. (I must have been grumpy the first time I wrote it). After thirteen years missing, Faith’s older sister Laurel is finally home. Now seventeen, Faith barely remembers a life before the kidnapping, a life when she wasn’t eclipsed by the disappearance of Little Laurel Logan. She’s glad to have her sister home, but still in La After rereading THE LOST AND THE FOUND for the third or fourth time, I’ve upped my rating from 3 to 4 to 5 and for the first time I’m completely rewriting my review for a book. (I must have been grumpy the first time I wrote it). After thirteen years missing, Faith’s older sister Laurel is finally home. Now seventeen, Faith barely remembers a life before the kidnapping, a life when she wasn’t eclipsed by the disappearance of Little Laurel Logan. She’s glad to have her sister home, but still in Laurel’s shadow. Faith is so sympathetic, she understands Laurel’s life has been exponentially more difficult than hers, and Faith feels twinges of jealously then guilt. She’s so sensitive to Michel, her dad’s partner, being lost in the shuffle of Laurel’s return, much like Faith herself. Cat Clarke’s characters in THE LOST AND THE FOUND are complex, flawed and relatable. Clarke gave Faith a believable, engaging and subtly sarcastic voice, kept the plot moving at a steady pace. My heart was invested in Faith’s journey and to a lesser extent, with Laurel. I have a weird obsession with stories about people who could - or not - be who they seem to be. There's something so creepy about thinking that you know who someone is, but that they could really be someone else. The Lost and the Found is a story about Faith, whose older sister disappeared when they were both young children. Thirteen years later, Faith is a teenager and her mom receives a call -- Faith's sister has turned up. I loved the subtlety of this story, which manages to a) describe the ter I have a weird obsession with stories about people who could - or not - be who they seem to be. There's something so creepy about thinking that you know who someone is, but that they could really be someone else. I loved the subtlety of this story, which manages to a) describe the terrible impact of Lauren's disappearance on her family b) let the reader watch Lauren try to re-integrate herself into the family, and the family adjust to her presence and c) slowly, slowly raise doubts about Lauren and why she is back. Yes, this was slow-paced, but I didn't mind that. Enjoyed it! A family thriller that tackles one of the darkest subjects. The Lost and the Found is a pacey read told through the eyes of Faith, the sister who wasn't taken. Now seventeen, she misses her sister and hates what Laurel's disappearance did to her family, but she's also tired, fed up and cranky. Then Laurel returns. It's the miracle they were always hoping for. They can finally have what Faith has always wanted: a normal, boring family. But the press won't leave them alone, and what's worse, Laure A family thriller that tackles one of the darkest subjects. The Lost and the Found is a pacey read told through the eyes of Faith, the sister who wasn't taken. Now seventeen, she misses her sister and hates what Laurel's disappearance did to her family, but she's also tired, fed up and cranky. Then Laurel returns. It's the miracle they were always hoping for. They can finally have what Faith has always wanted: a normal, boring family. But the press won't leave them alone, and what's worse, Laurel and her mother are inviting them in. I received an e-ARC of this book from Random House Children’s and Crown Books for Young Readers via NetGalley in exchange for an honest review. Thank you! This book was intense and powerful the entire way through. It’s so emotional and shocking and complicated. There was mystery and suspense. The whole story was complicated and you never really know where you stand with what’s happening. There were some things that were predictable, which I’ve had a tendency to do lately but the ending was mind blowing and unexpected. The only thing that really bothered me about the plot was that I felt like the romance was unnecessary. I don’t know what it was about the writing style of this book but it was totally addicting. It’s fast paced and easy to read. It’s intense and powerful and every time I sat down to read, I was consumed by the story. I even stayed up to 2 am once. It was full of depth and it was captivating. But at the same time the narrative was jarring and sometimes it was hard to grasp my mind around what the main character was thinking and feeling. I am torn between my feelings on all the characters in this book. I liked some and did not like others. Faith, our main character, is interesting. I had a hard time connecting with her at first. The narrative is really hard to connect with in the beginning. But in general, Faith is really emotional considering everything that is happening in her life. She’s torn on what she’s feeling. She’s angry and vulnerable and annoyed. But at the same time, she’s happy and looking forward to getting to know her sister. She has a sarcastic kind of personality and voice and I liked her a lot more when she was annoyed and bothered by the actions of the people around her so it was frustrating when she was happy because it felt a little fake haha. I was torn with how I felt about the side characters. Some felt complex and interesting. They intrigued me and made me question what was happening in the story. But there were others that I felt were simple and not needed. One in particular I felt was only used for the movement of the plot instead of actually having a meaningful presence in the story. However the relationships between the characters were so intense and complex and I definitely didn’t see that ending coming, it affected everyone in different ways which blew my mind. (view spoiler)[To be honest, I have warring feelings on this book. On one hand, it was easy to read but on the other, I never really had any desire to pick it up. The plot is powerful. We follow Faith, a girl who has lived her whole life behind the shadow of her sister, who was kidnapped when they were kids. Thirteen years later, her sister Laurel is found and everyone has to adjust to this new presence and their new normal. The story was completely addicting and intense when I was reading. It was so fast paced and easy to get lost into that I would fly through it. My heart would beat so fast even when things were calm because I knew not everything was like it seemed. I knew to be suspicious, because it’s a thriller book so obviously don’t trust everything, but I was still caught up in the emotion and the suspense of it. Unfortunately, when I wasn’t reading, I had no desire to pick the book. Some plot points were predictable and I saw them coming a mile away which was really unfortunate because it made me want to skim and read quickly to get to the climax of the story. Some of the relationships between the characters were used only to move the plot along and to bring about the catalyst which pushed for the climax and that kind of bothered me. It felt like unnecessary drama and almost like lazy writing in my opinion. But that ending completely blew my mind. The twist was easy to figure out like I said, but the resolution afterward and the epilogue that almost felt like an open ending were intense. I did not expect that finale whatsoever and it left me grasping at straws and I’m still trying to wrap my head around it. The romance in this book felt unnecessary and forced. I didn’t find anything compatible between the two characters and it was used more as a way to push the plot forward. That could’ve been done in a separate way that still felt genuine and didn’t make the relationship feel cheap. Faith frustrated me most of the time. While I understand that she’s going through something so huge, after spending her whole life with this invisible presence being more important than she is, suddenly that presence is actually there and there’s a lot of conflicting emotions that come with that. Yet at the same time, I didn’t want her to be happy at all. I wanted her to be angry, to be frustrated, to yell and scream because she wasn’t taken that seriously. Yes, I know how unrealistic that sounds but that’s what I wanted. It obviously makes more sense for her to be conflicted between happiness and anger, and I still enjoyed seeing how she dealt with that though it annoyed me sometimes. Her narrative almost felt unreliable at times, but maybe that’s just the way it was written because she got suspicious real quick and she felt like she couldn’t really trust her instincts. I wanted to talk a little about the parental units in the family because unlike most YA books, they are extremely prevalent in the novel. Faith and Laurel’s Mom annoyed me a lot. I felt like she was focused on things that didn’t necessarily matter and that she was more conscious of one daughter over the other. It made me angry and I’m still bitter that no one told her that to her face. Dad on the other hand tried his best to keep it civil but he still tended to be neglectful towards Faith. I can’t begin to pretend that I know what they were going through but if I was the kid left behind, I’d be resentful of the way my life was handed out. Michel is my favorite adult in this whole book. I don’t want to explain much of his involvement but he’s the only one who really takes into account how Faith could be feeling and is the only one to approach her to ask what she’s thinking. I loved their relationship. Faith Logan’s childhood has been dominated by her sister Lauren’s abduction, so thirteen years later when a girl turns up at the Logans’ old house holding Laurel’s old teddy bear, it’s like a miracle has happened. But things aren’t always as they seem and as Laurel’s behaviour gets more erratic, Faith starts to get paranoid. I really liked the writing style throughout the book - Faith had a slightly sarcastic narrative that took the edge off a pretty depressing subject matter - but I did find that the first third of the book dragged. It was kind of setting the stage and I liked the background to Faith’s home life and how Laurel’s abduction impacted her family, but not much really happened. Faith’s best friend was pretty cool, but her boyfriend sucked. He was literally the worst book boyfriend I’ve ever read about. He was physically unattractive, and okay looks aren’t everything, but he had questionable personal hygiene and was a total knob to boot. There’s a plot point that relies on him being a wanker, but honestly it made me respect Faith a whole lot less for being with him. I got that she was attracted to him because he had no interest in Laurel’s abduction, but I’d have respected her a lot more if she’d chosen to stay single. Things changed in the second half of the book. I started to get the distinct impression that Laurel wasn’t all she seemed. She started to get really creepy and Faith started to get really suspicious and stalkery. The tension ramped up and I started to plough through the remaining chapters. I did guess the plot twist early on, but the explanation and backstory behind the twist were nicely creepy. The author also had some interesting commentary about how kidnappings are publicised and the role of the press. It felt like the book stemmed from the author wondering what would happen if Madeleine McCann suddenly turned up. The press furore surrounding Laurel’s abduction was remarkably similar to the McCann case: attractive blonde child with parents who know how to play the press card getting all the headlines, while hundreds of other socially disadvantaged missing children barely get a paragraph written about them. The ending felt a little rushed, but it was a satisfying conclusion. All in all a pretty good read. I've been a fan of Cat Clarke for a while, so when I received The Lost and The Found in the mail, I was overjoyed. Obviously, when you dive into a book where the author has written amazing books before, you have high expectations. Cat Clarke's writing is perfect for YA. She somehow manages to perfectly capture the thoughts and feelings of a teenager, without actually being a teenager herself. She writes to an extent that if the protagonist hates a character, you start to hate a character. With this it makes it surprising when the character does something that you wouldn't do, but that’s what makes the book intriguing. I do read a lot of YA, but I have to say I'm always excited to see Cat Clarke in the bookshops I go to, because I can imagine other people reading her books and enjoying them just as much as me. The characters were the main focus of the entire book. The main character, Faith, is brilliant. The whole way through the book, Faith would say or do something and I would have to stop myself from nodding furiously, or yelling 'Yessss!' at the book. She's interesting and you never know what she's going to do next. Faith isn’t perfect, so there are some moments when she does something crazy that you wouldn’t even dream of doing, but that makes her seem like a person, rather than 100% fictional and made up. My personal favourite character was Michel. At the beginning of the book, I was convinced he was her brother, only to be told otherwise later on. Michel is the kind of person everyone needs in his or her life. Someone who asks if someone is okay even if they know EXACTLY the problem and why it's bothering them. Laurel was a whole other story. I always love a good book where there is a certain character everyone else loves, but you despise. I felt that Laurel was one of those characters I just love to hate. Laurel is one of the most developed characters I've read about, and you never know what to expect with her, whether she'll be angry about something or happy. She's unpredictable in an emotional way, rather than Faith, who's unpredictable in a physical way. While I was reading this book there wasn't a moment that I wasn't full of suspense. There was the kind of build up so you knew something was going to happen, but you didn't know what or when, so you just had to keep reading to find out. The beginning was great, because unlike some books, you just jumped straight into the action, without long character introductions. Whereas in some books you have many tiny plot twists where you're just like 'oh gosh', this book amazingly had a massive build up to one of the most out of this world and crazy and shocking plot twists in the whole of human history. I promise I'm not being dramatic. What also shocked me in this book was the romance, or should I say, the lack of it. This is definitely not a contemporary. I love a good romance, but I also love how Cat Clarke knew there wasn't enough room for romance in the story, but she knew that she had to include a tiny problem to do with the romantic side of Faith. I hate being a black sheep, guys. Anyway. I didn't hate this book or anything. But I had read so many great reviews that maybe my expectations were too high? No, I didn't dislike it, I just... felt nothing toward it either way. In fairness, I guessed what was happening really early on, and turned out to be right, so I guess that is pretty anticlimactic. The family stuff. This story is super family focused, since Laurel's disappearance and such has kind of been the center of their world. I liked that Faith was so close with her stepfather, and I liked that he was there for her, especially when her parents just could not be, emotionally. Faith was pretty realistic, in my opinion. Like, she was selfish from time to time, but who isn't? And she did try so hard with Laurel and with her parents, but man, this was not an easy situation for anyone, let alone a teenaged girl! The book did pick up a bit in the second half, so even though I felt sure that I knew how things would end, I still was reading it at a pretty good pace. Faith's boyfriend was the actual worst. I don't even know why he was in the story, unless the point was just to make me rage. Which I did. Because go away, dude. And her friends were pretty much crap too. I was glad she had her stepfather, because seriously, none of these other people deserved to be her friend. I didn't feel a sense of urgency, because everything seemed a bit... obvious to me. Not just the "big" stuff either, but some of the smaller points. Frankly, it just didn't stick with me very much. When I was done I was satisfied, and then moved on and kind of didn't really think about it again. Bottom Line: Not a bad story, and I enjoyed the writing, but I felt almost like I'd heard the story before since I felt like I knew what would happen. Faith was a great character though, and I'd definitely consider reading more books from the author, I just think this one maybe wasn't for me. Cat Clarke has got be with out a doubt one of my favourite YA authors. I've read nearly all of her books and have highly enjoyed every one of them. The majority of this authors books tend to be along the lines of suicide and sexuality which makes The Lost and the Found stand out slightly with it being a totally different story line. The Lost and the Found is a bit of a slow burner, not in a bad way though. Whilst not as dark as her other books, there is just something about this story line that Cat Clarke has got be with out a doubt one of my favourite YA authors. I've read nearly all of her books and have highly enjoyed every one of them. The Lost and the Found is a bit of a slow burner, not in a bad way though. Whilst not as dark as her other books, there is just something about this story line that keeps you intrigued and makes you want to read more. Faith and her family have pretty much plodded though the last thirteen years since Laurel went missing. All of them coping with her disappearance in their own way. When Laurel suddenly turns up after all those years, all but Faith are ecstatic to have her back. I really felt for Faith, she has missed her big sister and overall is glad to have her back, but being an only child for the last thirteen years has her worrying how having Laurel back will alter that. Some people might see that as being selfish but I think it is a big adjustment for all the family and all of a sudden the parents attention is all focused on one sibling while not meaning to, but to a certain extent leaving the other one out. Not only does Faith find it hard adjusting to having Laurel back home but she keeps getting a little niggle that something isn't quite right with her sister which she tries to put down to what must have happened to her when she was abducted. Laurel is certainly a hard character to fathom out. Obviously she has been through a traumatic time and at times my heart really went out to her. Other times though, like Faith, I had certain doubts and fears. Retrouver sa sœur après 13 ans est une histoire perturbante. Faith est un personnage très émouvant, elle a toujours vécue dans l'ombre d'une sœur qu'elle n'a jamais connu et apprendre à vivre avec une inconnue peut s'avérer étouffant. J'ai toujours un peu de mal avec Cat Clarke, mais ses romans sont tellement particulier, que je me laisse tenter, malgré un début un peu plat, l'histoire retrouve son souffle vers la fin. Un très bon livre YA, avec une héroïne très attachante et une ambiance qui cloche de plus en plus... Perdue et retrouvée se dévore! Ce roman n'est définitivement pas une déception, mais ce n'est pas non plus un coup de cœur. On m'avait prévenue avant même que je commence ce roman. Cat Clarke, on aime ou on déteste. C'est aussi simple que ça. Je savais que c'était une auteure au style bien particulier, et même si je n'ai pas adoré ce roman, je suis fière de pouvoir dire que j'ai enfin lu un Cat Clarke. Franchement, ça manquait à ma culture. Dans ce roman, on fait la connaissance de Faith qui a 17 ans. Toute sa vie, elle a vécu dans l'ombre de sa sœur, kidnappée sous ses yeux alors qu'elle n'avait que 4 ans. Le pays tout entier a été touché par l'histoire de la petit Laurel Logan, disparue il y a maintenant 13 ans. Selon certains, il n'y avait plus aucun espoir, mais la famille de Faith n'a jamais arrêté d'espérer le retour de Laurel. Et lorsqu'une jeune fille correspondant à sa description est retrouvée, la vie de Faith va totalement être bouleversée. Elle s'est toujours considérée comme une enfant unique et du jour au lendemain, elle se retrouve avec une grande sœur. Perdue et Retrouvée, c'est ça. C'est l'histoire de Faith. Et je dois dire qu'elle m'a à la fois touchée et énervée. Au départ, je l'ai trouvé un peu égoïste. Même si elle est très heureuse de retrouver Laurel, Faith n'accepte pas très bien le fait que sa sœur soit au centre de l'attention. Tout le monde n'en a que pour Laurel, y compris ses parents. Mais peu à peu, je me suis mise à sa place. Et j'ai compris ce qu'elle ressentait. J'en avais moi-même marre d'entendre parler de Laurel Logan. Je voulais simplement que quelqu'un s'intéresse à Faith parce qu'on semblait totalement l'avoir oublié dans toute cette histoire. J'ai détesté ce sentiment d'impuissance!! DÉTESTÉ! Je l'avoue, j'ai toutefois trouvé un peu agaçant que Faith ne se confie pas plus que ça à ses parent ou à ses amis. Elle est témoin de choses qui n'ont pas de sens. Elle est très observatrice, mais elle n'ose pas en parler. Ce qui fait qu'elle commence sérieusement à angoisser à un certaine moment. Et moi également par la même occasion. Ce n'est que maintenant, en écrivant ma chronique, que je me rends compte du véritable talent de Cat Clarke. Même si l'histoire qu'elle nous présente peut sembler banale au premier abord, il n'en demeure pas moins qu'elle a parfaitement réussi à ma faire ressentir ce que son personnage principal a ressenti. Tout au long de ma lecture, je me suis mise à la place de Faith. Je ne compte plus le nombre de fois où je me suis dit que telle ou telle chose était bizarre. J'en suis presque devenue parano. Et les quelques petites extraits à la fin auxquels on ne s'attend pas du tout et qui viennent à nouveau brouiller les cartes. Alors que je pensais avoir enfin saisi ce récit, Cat Clarke me sort ça! Certes, comme je l'ai déjà mentionné, l'histoire n'a rien d'extraordinaire en soi. On suit seulement l'histoire de Faith au jour le jour. Et même si j'ai trouvé ce roman passionnant sur le plan psychologique, il n'en demeure pas moins que ça manquait un peu d'action à mon goût. J'ai également vu venir la révélation de la fin de très très loin. D'où la note que je lui ai accordé. En somme, il s'agit d'un roman très intéressant, surtout sur le plan psychologique. On ne doit pas s'attendre à une histoire extraordinaire puisqu'il ne faut pas perdre de vue qu'on s'adresse à un public cible assez jeune, mais c'est bien écrit et prenant. Même si dans mon cas ça n'a pas été un coup de cœur, je ne doute pas une seule seconde qu'il plaira aux fans de thriller ou de romans du même genre. Et je retenterai bien évidemment l'expérience Cat Clarke un de ces jours. 3.5/5. This book was interesting as I really enjoyed following the MC's emotional journey. I kind of predicted the ending a little bit but I found the attention on missing children and on morals really intriguing. Cat has written non-fiction books about exciting things like cowboys, sharks and pirates, and now writes YA novels. She lives in Edinburgh with a couple of cats, Jem and Scout, who spend their days plotting to spit up furballs at the most inconvenient times. She likes chees Cat was born in Zambia and brought up in Edinburgh and Yorkshire, which has given her an accent that tends to confuse people.